With deep roots in traditional craftsmanship, Danish company Scanpan create functional and timeless tools for the modern kitchen. Since the company was founded in 1956, it has been at the forefront of innovation and technology. Believing good food deserves quality tools that are made with care and respect; they produce a wide range of kitchenware that is both environmentally friendly and of the highest quality. Scanpan’s passion for good food is reflected in their production methods. By using 100% recycled aluminium they are able to greatly diminish energy use and waste production without compromising on quality. 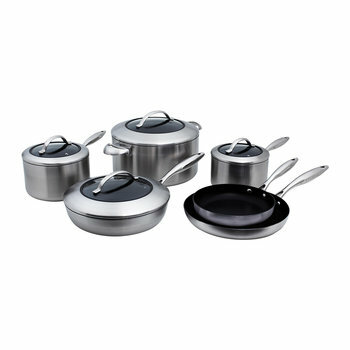 As part of an on-going product development, they have developed a unique non-stick coating which is completely free from toxins and prevents the transfer of harmful chemicals to your cooking. Striving to make a difference, their extensive range includes saucepans, frying pans, chef pans and woks, all uncompromising kitchenware of the highest quality and durability.